Blogging will be suspended temporarily while we mourn the passing of my brother Paul. He had been sick his entire life and was one of the most determined souls I have ever met. We are not surprised, but heartbroken. He was a terrific guy. A storm-damaged home in Port Sulphur, Louisiana, bears a message of resilience Tuesday. So it looks like the indefatigable souls of Port Sulphur are digging out. God bless them, every single one of them. "OH NO!" the president exclaims. "That’s terrible!" Finally, president looks up and asks, "How many is a brazillion?" Don Adams of Get Smart (and later Inspector Gadget) has passed away at age 82. I did a shoe phone skit in my 2nd grade talent show with Claire Donovan as 99 in 1974. Update: Kip Esquire at A Stitch in Haste has a tribute to one other beloved character portrayed by Adams, the animated Tennessee Tuxedo. 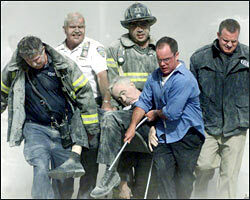 I did not know this, but fallen 9/11 hero and Fire Department chaplain Father Judge was a homosexual. Did that stop him from being a chaste, honorable,and beloved priest? Of course not. The article in the Times also mentions some high profile conservative Catholics, including Catholic League president and firebrand Bill Donohue, who feel that the proposed rule to bar homosexuals from the priesthood is wrong. "I don’t really care, and I don’t think most Catholics care if a priest is gay" as long he does not act on his urges, said William Donohue, the president of the Catholic League for Religious and Civil Rights and a fierce critic of what he has called declining moral standards. I would hasten to add that one of Christ’s parables was that of the shepherd who rejoiced when he found the lost sheep. I am still trying to recall the one where the shepherd loses the gay sheep and says to hell with him. Can anyone recall which gospel that one was from? Hat tip to the Political Teen. I am semi-skeptical of the quiz, as OK Cupid’s quizes are horrendous. …is in New Orleans. Well, almost. Speculators are sensing an opportunity. Two months ago, Steve Young bought a two-bedroom condo in New Orleans’ Garden District as an investment for $145,000. Last month, he was transferred by Shell Oil to Houston. Last week, he put the condo on the market. In a posting on Craigslist, an Internet classified advertising site, Young asked $220,000. He got a dozen serious expressions of interest — enough so he’s no longer actively pursuing a buyer. "I’m pretty positive the market’s going to move up from here," he said. So, to their surprise, are many others. "I thought this storm was the end of the city," said Arthur Sterbcow, president of New Orleans-based Latter & Blum, one of the biggest real estate brokerages on the Gulf Coast. "If anyone had told me two weeks ago that I’d be getting the calls and e-mails I’m getting, I would have thought he was ready for the psychiatric ward." Messages from those wanting to buy houses — whether intact or flooded — and commercial properties are outrunning those who want to sell by a factor of 20, said Sterbcow, who has set up temporary quarters in his firm’s Baton Rouge office. I blogged previously that New Orleans would benefit from opportunity seekers looking to make their mark in a place that had no place to go but up. This is coming to pass. Craigslist.org is one of the best kept secrets in real estate advertising.